CommInnovations is committed to supplying our customers with rugged and reliable products that serve their requirements. We are located in upstate New York in the beautiful Catskill Mountains. We always welcome visitors. Use MapQuest for directions to us. All parts, materials and procedures used by CommInnovations are in accordance with military and FAS specifications and standards wherever possible, such as, amplifiers (MIL-STD-129 and MIL-STD-130), and inspection (ISO 9000 Compliant). For customers with approved credit, terms are Net 30 days. CommInnovations reserves the right to add an additional 1 1/2% per month on the unpaid balance after 30 days. Terms for non-approved customers is COD, prepayment or irrevocable letter of credit. CommInnovations also accepts Visa and MasterCard. Minimum order is $50.00 for U.S. and Canada and $150.00 international. Comm Innovations was incorporated in November 1994 with objective is to provide customized communication equipment and solutions to our customers in the aviation market. The target customer base was helicopter operators in law enforcement, border patrol, firefighting & emergency medical communities. Our first product was switch & cable assemblies, introduced in 1995. The switch and cables are used interface the aircrewman’s headset with the aircraft intercom & radios. A typical unit has a slide switch to key the intercom, a PTT to key aircraft radios & a volume control. The cable to the aircraft can be coil or straight & length as specified by the customer The product featured ergonomically designed switch case & the enhanced ruggedness by using over-molded strain reliefs at the known weak points of previous designs. These improved features of switch and cables were readily received in the targeted markets & today the company enjoys the lead market position in the US & has a significant share of the global market for this product. Comm Innovations has two domestic distributors & one in Europe. Comm Innovations also has a network of OEM’s (Original equipment Manufacturers) & dealers worldwide. This lead position has not deterred the company from improving the product. The design has been modularized using components terminated in miniature connections. This improvement permits the user to make solder-less repairs & reconfigurations. Reconfigurations are common in the industry. 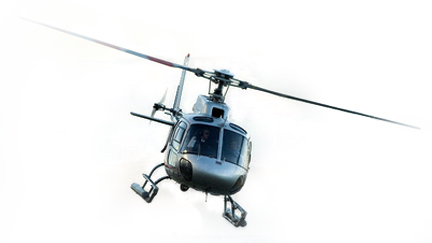 When a helicopter operator leases his aircraft one year to the US Forest but the next year the same aircraft may be used in law enforcement or EMS where the user has different mission requirements. Comm Innovations has also adapted its products for use with active noise reduction (ANR) headsets common in aviation today. Comm Innovations has developed a reputation as problem solvers, which has led to an expansion of its line of aviation communications products to include devices such as adapter cables, impedance adapters & interfaces cell phone and portable radios. Impedance adapters permit the use of headsets designed for use with one type intercom system to be used with an otherwise non-compatible intercom system. This is common since civilian & military intercom systems are built using different standards. The connectors used in commercial aircraft, general aviation & helicopters are all different from one another. US & European standards for military intercom systems are also different from one another. All of the products are assembled and tested on-site, with outsourced sub-assemblies and components selected from potential vendors for quality, economy and customer service. Fast turn around times has been a key to CommInnovations’ success & so vendors are chosen that can respond quickly. Local vendors are always used where possible. The parts being produced in short run, small quantity and customized for customer specific applications. Comm Innovations did not start out with the intention of being a supplier to the military. But military applications have become a large part of our annual sales. In 1996, E-Systems was under contact to the US Army to develop a seating & multi-place intercom system for the UH-60 Black Hawk that could be installed when passengers were being transported & easily removed afterwards. The UH-60 Black Hawk is a four-bladed, twin-engine, medium-lift utility helicopter manufactured by Sikorsky. E-Systems had selected an intercom that met the US Army’s requirements but it was civilian impedance & was not compatible with the army’s aviation headsets & helmets. E-Systems requested that Comm Innovations integrate our impedance matching technology into a switch and cable. This system is currently in wide use in the US Army especially in Iraq & Afghanistan. The Lockheed Martin C-130J "Super" Hercules is a four-engine turboprop military transport aircraft. The C-130J is a comprehensive update of the venerable Lockheed C-130 Hercules, with new engines, flight deck, and other systems. When the RAF purchased the C-130J they wanted a single cable that was compatible with three different style headsets all using different connectors & build standards. In 1997, Lockheed Martin contracted Comm Innovations to develop special cable assembly to meet these multiple uses. Because of the high EMI (electromagnetic interference), rigorous requirements were imposed by the RAF. Due to CommInnovations’ success in developing this cable, additional requirements for cables to be used with emergency oxygen masks & an interconnect station for use ground crew personnel were added to the contract. The success of the cables built for the RAF C-130J has led to additional business. The Alenia (Italian aircraft manufacturer) C-27J Spartan is a medium-sized military transport aircraft. The C-27J has also been ordered by the militaries of Italy, Greece, Bulgaria, Lithuania, Mexico, Morocco, and Romania as well as the US military. Italy received its first C-27J in October 2006. The Italian Air Force deployed two C-27Js to Afghanistan from 12 September 2008 to 27 January 2009 in support of NATO airlift operations. The US Air National Guard received four C-27Js in July 2010 and began using them for testing and training. The C-27J's first combat deployment later this year. Comm Innovations received a contract this week for cables to support this deployment. When the US Army developed a satellite command & control communications system for UH-60 helicopter, This system allows direct communications between the battle field commander with Centcom (Central Command) in the Tampa. Comm Innovations was selected to provide the cable assemblies. The previously developed cable for use in high EMI environments proved equally applicable in this application. The US Army was kind enough to give us a picture of then presidential candidate Barrack Obama & General Petreaus using our equipment on a flight over Iraq. Comm Innovations is working with AgustaWestland (a merger of Italian & UK helicopter manufacturers) on two programs. Both programs are currently in flight trials. Comm Innovations cables are being used in the flight test program & it is anticipated they will also be used when these aircraft programs go to production. The UK is having to contend with the evolution of the threat of low noise diesel-electric submarines operating near their coast. The U.K. airborne ASW role now falls exclusively to the Royal Navy and its Agusta Westland Merlin helicopter fleet, which is currently undergoing a major upgrade. The helicopters are now in flight testing & modifications are scheduled to begin later this year or early 2012 to extend the service life of these helicopters & to enhance their anti-submarine warfare capabilities. The AW159 Lynx Wildcat is an improved version of the Super Lynx military helicopter. The AW159 will serve in the battlefield utility, search and rescue and anti-surface warfare roles. The helicopter has been ordered for the British Army and Royal Navy. It is to enter service in 2014. Comm Innovations has also provided cables to Boeing for flight testing of the Boeing P-8A Poseidon (militarized version of the 737) currently being developed for the United States Navy. The P-8A is intended to conduct anti-submarine warfare, shipping interdiction, & will carry torpedoes, depth charges, anti-ship missiles, and other weapons. It will also be able to drop and monitor sonobuoys. The P-8 is intended to replace the aging fleet of Lockheed P-3 Orion anti-submarine warfare (ASW) aircraft (in service since 1962). The P-3 is used extensively around the world & it is reasonable to expect that many of these countries will also look at the versions of the P-8 as a replacement. When Comm Innovations first began operations it operated out of a desk at Astrocom Electronics in Colliersville using a borrowed laptop computer. All manufacturing was subcontracted to Astrocom. As the business grew, Comm Innovations eventually leased space from Astrocom & hired its own office & assembly workers. But by 2002 Comm Innovations needed more space & Astrocom was expanding its operations. so it was mutually agreed that Comm Innovations should move. Comm Innovations is now located on Pony Farm Road in Oneonta. The company occupies 10,000 sq ft & operates four business units. It addition to aviation communications manufacturing, Comm Innovations operates the Village Printer, Oneonta UHaul & American Storage Systems. CommInnovations was incorporated in November 1994 with objective is to provide customized communication equipment and solutions to our customers in the aviation market. The target customer base was helicopter operators in law enforcement, border patrol, firefighting & emergency medical communities. We want to hear from you! Fill out the form on our contact page and we will contact your asap!